Sometimes words are just not enough, sometimes they become meaningless, sometimes there are too many of them. Sometimes the shock is so profound you are stunned into silence. What on earth can be said now to ease the pain following the utter horror of the last few days and the hell that has descended on Leicester City and the whole football community? West Ham were part of it, well sort of. We were there, that’s all. Insignificant extras on a day that will be forever ingrained into the history of the game, just like the Munich air crash was 60 years ago. We can only offer, as a club and as individuals, our deep sympathy following the death of five people, including the much-loved owner and chairman of Leicester City, in the tragic helicopter crash that followed our 1-1 draw with the Midland club on Saturday evening. That we deserved that point, even a win, despite the rashness of skipper Mark Noble that reduced us to ten men for an hour, is just a footnote now, irrelevant in the great scheme of things such is the terrible loss of life that followed on a tiny piece of wasteland less than 100 yards from the King Power Stadium. It was a tremendous defensive performance by our team; spirit, effort, running, and a collective desire not to leave empty handed. Grady Diangana had a fine full Premier League debut, Declan Rice was outstanding as was ‘keeper Lukasz Fabianski and Issa Diop. But only they will remember the match. Any further analysis, player ratings, all that sort of stuff, just seemed utterly inappropriate. Sunday would have been a day when I would have tried to put something clever and meaningful (some hopes) together ahead of one of my articles that I inflict on KUMB editor Graeme Howlett. But I couldn’t manage a word. Several other bloggers that are involved in social media surrounding West Ham felt the same. What was the point, who really cared at that juncture. A period of silence, reflection, respect, seemed to overcome many. Others ploughed on, life goes on I suppose, but all I really managed to read and watch was the TV and radio as we all waited for official dreaded confirmation of the fatalities. Sunday was a dreadful day. What has unfolded since is too terrible really. How a heroic pilot guided the stricken craft away from crowds as it plunged to the ground, knowing as he did it, that he was about to die. The chairman and benefactor of Leicester City, Vichai Srivaddhanaprabha, died too along with staff, the pilot’s partner and a friend. What has emerged since is that West Ham people were much closer to the disaster than first realised. If you know the configuration of the King Power surrounds, you know that the two car parks B and E in the south east corner of the stadium are where VIPs, press, corporate guests and the like park their cars. Also the away team coach is parked in that area, and driven round to the players' entrance in the west stand at the end of the match. Our goalkeeper Adrian tweeted that the coach had left what was to become a crash scene only minutes before the chopper came down. There were still guests and press leaving the ground at the time. Newham Recorder writer Dave Evans was with his photographer Rob Newell and fellow scribe Steve Blowers as they headed back to their car. Evans has written a moving personal account of seeing the craft come down as they walked to their car in the British Gas plant care park nearby. My own son was thankfully half way back to the station when the crash happened. It took me only minutes to contact him on hearing what had happened, where exactly was he? Was he O?. A couple of minutes I don’t want to go through again, with his mother standing by my side as I made the call. 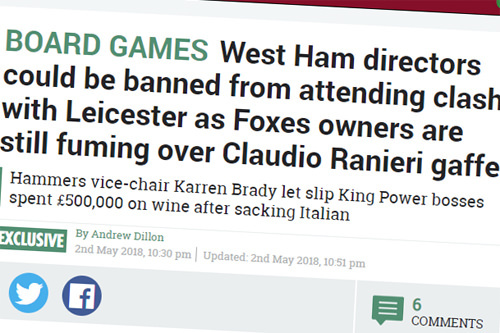 Then, of course, there was Karren Brady’s perfectly acceptable tweet that everybody from West Ham had safely left the stadium. Nothing wrong with that, but I feel it was innocently misinterpreted to suggest that the fans were all safe. I believe she was referring to the official party, players, management, staff, club officials. How could she have known where 3,200 West Ham fans were outside the ground? She wasn’t at the match and was getting here information from colleagues in the west stand. No problem with the tweet, any information however small about anyone in such circumstances when family members are 100 miles away, is welcome and helpful. But she pointedly didn’t mention the fans in her tweet and the later interpretation that fans were safe was misleading. It was not until 4.30pm the following day that police briefed TV media that they were now certain that nobody on the ground had been killed in the crash. The day before, many of our fans had walked around the ground to the players' entrance for autographs and pictures, and they would have been in the vicinity of the crash maybe ten minutes before it happened, because that is when the team coach left the stadium. I have been told by old mates who were working at the stadium at the time, and were packed off to hotels to carry on the coverage the following day, that there was a genuine fear that someone on the ground was caught up in the crash. It was a miracle that the occupants of the helicopter were the only tragic victims. Since then our club have handled the aftermath well. Heartfelt statements of sympathy, held back until Leicester had made their own announcements on Sunday evening, and even the club website’s match report did not appear until a respectful time late on Sunday. I was discussing all this with a pal, someone a little more cynical than me who would fall into the "unnecessarily negative" category - now the buzz word in a club media department. A department who have banned our KUMB editor, after 20-plus years covering the club, for stuff they didn’t like on his twitter account. And that discussion threw up something I had forgotten. Brady had managed to upset the Leicester chairman, about the only club this affable guy had got the hump with, when she ran that piece in her Sun column last season. You must remember. She had written about how Vichai had spent £500,000 on a wine bill in Mayfair and, it was claimed, had told a fellow Premier League chairman at Hedonism Wines in Mayfair that he was about to sack Claudio Ranieri. That little exchange, you may recall, was the reason that Srivaddhanaprabha blocked the transfer to West Ham of Islam Slimani. He was not prepared to do business with us. Lots of apologies followed. If only her Ladyship could just dump the column and stick to occasional tweets. Even if they are misinterpreted.